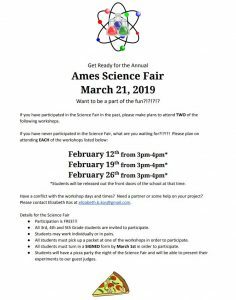 The Science Fair is this Thursday!!!! 6:30pm-8:00pm Hands on science for the whole family begins!!!! Edison’s workshop- working with static and current electricity generating a static lightning bulb using our Van de Graff. Finally, if you are available to help with the science fair, please let Elizabeth know! We need one parent to volunteer to supervise the food from 4:30 to 6pm, and 2 parents to help direct children to their space for their presentations from 4-4:45pm. Please contact Elizabeth Kos at elizabeth.b.kos@gmail.com if you have any questions!